See Global Voices special coverage page  on the South Ossetia crisis. While Koreans enthusiastically follow the Beijing Olympics, they are also busy studying what’s going on between Russia and Georgia and what the attack means to world politics. It has been one of the main topics among bloggers. A few netizens  focus on the pro-American tendency of Georgia. On the other hand, some netizens go back to history. 그루지아를 친미라는 이유로 욕하지 마세요. 전쟁 이유는 남오세티아에서 러시아의 후원을 받은 오세티아인들이 그루지야인들을 인종청소하면서 시작된 것이며 남오세티아 자체도 그루지야인의 의지와 무관하게 레닌과 스탈린이 맘대로 자치구역을 설정한데서 비롯되었습니다. 19세기 비록 페르시아의 제후국이였지만 독자세력이었던 그루지야를 러시아군이 협박해서 보호령으로 만들었고 이후에는 그루지야 주둔 러시아 제정군이 그루지아 국왕의 왕위를 빼았아서 그루지아 주둔군 사령관에게 이양하고 이후에 정식으로 러시아 제국에 편입된 것입니다. 오세티아가 문제가 아니라 그 지역 상당수가 그루지야 땅인데 그루지야는 오히려 독립 이후에도 영토가 많이 줄어들었습니다. […]또한 남오세티아 대중전선이 북오세티아와 영토통일하겠다고 커밍아웃하기 전까지만해도 러시아 통합이전부터 그루지아와 오세티아는 아무 충돌없이 오랜기간 지내온 사람들인데 오세티아인들이 왜 몇십년간 잘살던 친구를 배신하겠습니까? 현제 남오세티아의 인구중 90%가 러시아인 입니다. […] 역사를 안다면 그루지야를 욕할 이유는 없다고 봅니다. […]누가 제국주의를 옹호하는 것입니까? Don’t blame Georgia for being pro-American. The battle had started from the ethnic cleaning of the Ossetians in South Ossetia who received support from Russia against Georgians, but South Ossetia was also designated as an autonomous region by Lenin and Stalin without any notice to Georgians. Georgia, which was an independent authority regardless of the feudal kingdom of Persia in the 19th century, became a protectorate of the Russian Army and later it was included in Russia. It’s not just the problem of Ossetia. Georgia also lost some land after independence. […] Before South Ossetia tried to unify with North Ossetia and was unified with Russia, Georgia and Ossetia have stayed together without any conflict. But why did the Ossetians suddenly betray friends of several decades? 90 percent of the population of South Ossetia is Russian. […] If you know history, you can’t just blame Georgia. […] Who is supporting imperialism? As a common theory, many netizens  think the reason for the battle to be a power struggle over the oil pipeline. 이번 그루지아-러시아와의 전쟁(국지전)을 보며, 마음 한참 졸였더랬다..아.. BTC송유관이 어디로 흘러가는지 미처 판단을 하지 못하는 우를 범했더랬다. 오판이였다는 것은 부시의 한국 방문 이전 방문한 국가가 터키였다는 것이었다.(2008. 8) 그 동안 터키를 이란/이라크 압박용 카드로만 파악했다는 것이 중요한 오판이유라고 해야되나? 이라크/이란/아프가니스탄 등의 미국이 노리고 있는 (이미 두군데는 쳐들어간) 국가만 눈에 보였던 것이 이번 사태에 대한 나의 심각한 오판의 원인이였던 것이었다. 그러나 미국의 경제문제로 인한 달러화의 가치가 주루룩 떨어지고 있는 이 시점에, 달러화 가치를 회복할 수있는 몇개의 카드가 있었는데, 그 첫번째는 중국, 두 번째는 유럽이다. 중국이야 위안화 절상을 해주면 해결될 일이나, 오히려 반대로 행동하고 있고, 올림픽을 개최하고 있는 이 와중에 어찌 팰려도 팰 방법이 적당치 않다. (어떤 카드를 찾으려고 하겠지만.. 그리 녹녹치는 않다. 카드가 없는건 아니지만 말이다.) 그러나 유럽은 그 공격지점이 여러군데 있었고, 때리기 어려운 것은 유럽도 마찬가지지만 미국은 예상외의 지점(나의 예상밖이였다..)에서 헛점을 발견 했다. 바로 BTC 송유관이었다. 지도를 보시면 아시겠지만, 이 파이프 라인의 흐름은 상당히 정치적인 영향이 존재한다.이란을 관통하거나, 아르메니아를 관통하면 될 것을.. 왜 우회했는지? 터키로 안가고 흑해로 바로 빠지면 유럽으로 더 가기 쉽지는 않은지 고려해볼 일이다. 이 파이프 라인의 대다수 지분은 유럽이며 그 다음이 아제르바이잔, 미국, 터키, 일본 순이다. I was worried while I was observing the battle between Georgia and Russia. I even didn’t think about the BTC pipeline. Before Bush visited Korea, he went to Turkey. I was just thinking that Turkey is regarded as a card to America in order to give the pressure to Iran and Iraq. That was my mistake. What I was just interested in observing was the countries, Iraq, Iran, and Afghanistan, where America has been targeting (they already attacked two countries). That was my mistake. While economic problems of America are getting worse and the value of the American dollar is going worse, they have several cards left. The first is China and the second is Europe. They might try to revaluate the currency of China, but China will not follow it. In addition, the Olympics is going on and, therefore, what they can do now is limited. However, Europe is also a hard place to attack. But America found a target that I didn’t expect at all. It was the BTC pipeline. Then what is the BTC pipeline ? As you can see through the map, the pipeline contains political influence. Why doesn’t it go through Iran and Armenia? Why did it make a detour? It looks much easier if it went through the Black Sea in order to go through Europe, not through Turkey. The stake of the pipeline  is mostly handled by Europe. The next is Azerbaijan, America, Turkey, and Japan. 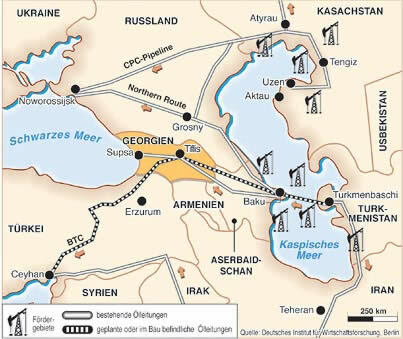 Photo of Baku-Tbilisi-Ceyhan Pipeline . Here are more opinions after his argument of the conspiracy theory below. It seems that it is the hegemonic battle between Russia and America on oil from the Caspian Sea. The BTC pipeline was made for the safe supply to the Western countries through Georgia that is friendly to America. Putin who is worried that would weaken Russian influence has been not nice to pro-America, Georgia. From now on, the invisible battles over resources between America and Russia in Eurasia will be more. Conspiracy theory 1: America tried to have a battle after enticing Georgia. If they do that on the same date of the opening of the Olympics, they guessed that Russia would not be so active. But Russia attacked on a large scale. Out of the American scenario… It is awkward that America is suddenly involved in front. So Bush said, ‘don’t do that.’ but the answer from Russia was ‘you did whatever you wanted when you attacked Kuwait.’ the sudden tackle from France between Russia and Georgia, ‘There is the Olympics now. If the battle goes longer, America can step in. Then more Georgians will be hurt. Look at Russia! They take cruel action…’ The producer was America, the main casting was from Russia, and the benefit goes to France. What is the status of Georgia in international society? It is the main question  of the netizens. 세계적으로 석유 자원이 고갈되고, 그 고갈될 것이라는 명제로 현재까지 석유류에 대한 투기세력들 때문에 국제유가가 150불 까지 간 적이 있었습니다. 어찌 되었건 앞으로 국제 유가는 아무리 낮아져도 70불 정도 이상은 될 것이라고 예측을 하고 있습니다. 그렇다면 세계에서 가장 주목받고 있는 새로운 유전 지대가 카스피해입니다. 이전에는 카스피해의 석유 생산 단가가 높아 매장량이 있음에도 경제성을 이유로 개발 하지 않고 있다가, 국제유가가 오름에 따라 경제성이 생긴 것이지요. 그러나 카스피해는 단 하나 문제점이 있습니다. 그것은 내해 인 나머지, 배를 통한 수출이 안된다는것. 그래서 등장한 것이 송유관입니다. BTC라인과 SPC라인이 중요한 것은 카스피해의 석유가 러시아의 간섭을 받지 않고, 유럽으로 갈 수 있는 통로이기 때문입니다. 그래서 미국은 국제 유가 안정을 위해 이 송유관을 중요하게 생각하는 것입니다. 왜냐하면 BTC 라인이 생기기 전에 카스피해의 석유는 모두 러시아를 거쳐 유럽으로 수출 되었는데, 이제 CIS 국가들이 러시아의 간섭없이도 석유를 수출 할 수 있게 된 것이지요. 그럼 곁 가지로 이란과 아프카니스탄이 요즘 자주 등장하는데, 이 역시 카스피해의 석유와 매우 깊은 관련이 있습니다. 지도에서 보면 알겠지만, 아프카니스탄과 이란 역시 지역사정이 안정되면 카스피해에서 생긴 석유를 수출할 수 있도록 송유관을 놓을 수 있는 국가 후보이기 때문입니다. 이쯤 되면 왜 미국이 아프칸을 침공 했는지 이해가 가시리라 생각됩니다. 그럼 그루지야가 나토에 가입하고 싶어도 못하는 이유는 러시아가 반대하기 때문입니다. 러시아의 가즈포름 같은 회사가 유럽의 천연가스 등 목줄을 쥐고 있기 때문에 나토에 가입시켜 주지도, 못하기 때문이지요. 미국이 아무리 원해도 말입니다. 러시아는 남 오세티아 거주 러시아인들에게 반강제적으로 여권을 나누어 줬다고 합니다. 그리고 그를 빌미로 자국민 보호를 핑계로 그루지야의 영토를 침공해서 시범 케이스를 보여 준 것 같습니다. 다른 CIS 국가도 역시 미국쪽에 붙다가는 불같은 맛을 보게 될 것이다… 라고. 러시아는 CIS 지역에서의 영향력이 없어지는 것을 매우 염려하고 있습니다. 제 생각에는 이것이 남 오세티아를 침략하게 된 원인이지요. 올림픽 이전부터 남오세티아의 독립 세력들과 그루지야 군과 전투를 벌였었는데, 올림픽을 러시아가 이용한 것이라고 봅니다. 2000명의 사상자도 역시 러시아 측의 과장이라고 할 수 있습니다.참고로, BTC라인은 터키에서 이미 송유관이 보수중이라 현재 가동중이 아니라고 합니다. 그리고 러시아의 공격에도 불구하고 국제유가가 그렇게 오르지 않은 이유는 송유관이 1미터 이하 깊이에 매설되어 있어 비교적 공격에도 안전하다고 하기 때문이라는군요. The oil resource is dried up and under the proposition of the exhaustion and owing to oil speculators the international oil price went up to 150 dollars. It will not be lower than 70 dollars anymore in the future. The new oil field that the world will pay attention to will be the Caspian Sea. The unit cost of oil at the Caspian Sea was high and therefore due to the economic reason it has not been developed. But the high oil price generates its economical efficiency. But there is one problem. It is in an inland sea and therefore it is impossible to export it by ship. That’s why the pipeline was born. The reason why the BTC and SPC lines are important is that they are the only passages through which the oil can be delivered to Europe without any interference from Russia. Therefore, America regards it important for the stability of the international oil price. Before the establishment of the BTC line, the oil from the Caspian oil was exported to Europe through Russia, but CIS countries can export oil without any interference with Russia. In addition, Iran and Afghanistan have emerged in news a lot because they are related to the oil in the Caspian Sea. As you can see through the map, Afghanistan and Iran can be candidates for the pipeline that can export oil. Then it would be easy for you to understand why America attacked Afghan. The reason why Georgia can’t join NATO is because Russia is against it. Russian companies like Gazprom have so much power in Europe and therefore it will not happen even though America wants. I heard that the Russian government forcefully gave passports to Russians who lived in South Ossetia. Under the pretext of protecting their own nationalities, they attacked Georgia. If other CIS countries behave like that, it would be the same scenario. Russia is really concerned that they will lose the power in the CIS region. In my opinion, it is why South Ossetia was attacked. Before the Olympics, there was a battle between the independent group of South Ossetia and the Georgian Army, and Russia used the Olympics. The number of deaths, 2,000, might not be that much. For reference, the BTC line is under the construction of the oil pipeline in Turkey and therefore it is not in operation at the present. Regardless of Russia’s attack, the reason why the international oil price doesn’t go up is because the oil pipeline is located deeper than one meter and comparatively safe. Will it influence the oil price? It seems a major point of interest . The battle of Georgia doesn’t influence the international oil price at all. Unlike some bloggers and news articles have been concerned about, the international price seems not to care about the battle. In addition, it is over in 2 days. As long as America and Europe are not going to be involved in it, it will not cause the change of the oil price. If other countries like America are involved, it might cause tremendous changes to other matters as well as the oil price. However, in my own opinion, it will not be like that. Perhaps, they will try to find the compromise. But it seems that they don’t consider Georgia while they are looking for the point of compromise. It will be decided how much the Western countries will accept the expansion of the power of Russia. No matter what the result comes out, Georgia’s status will be weaker and Russia will take the benefit. Simply speaking, it is Georgia that becomes the victim. Not a few netizens interpret it as the beginning of another Cold War. 이번 러시아와 그루지아의 남오세티아를 사이에둔 전쟁은 많이 참고있던 러시아의 콧털을 그루지아 정부가 남오세티아를 공격하면서 뽑아버린 격입니다. 더욱 안좋은 이유는 화난 러시아에 대해 보호막이가 되어줄 NATO와 미국은, 아니 일단 미국은 군사력을 동원할 명분이 없기 때문에 그루지아는 사실상 그리 승산있지 않은 도박에 뛰어들은 것입니다. 그동안 미국은 이라크, 아프가니스탄, 이란에 미군을 보내 전쟁을 벌였기 때문에 그리고 코소보의 독립을 지지했기 때문에 심각한 아이러니에 빠지게 됩니다. 1. 다른나라의 영토주권을 침범하였기 때문에(이유가 어찌되었든간에) 러시아가 그루지아에 쳐들어가 영토주권을 침범하는 것을 비난하고 대응할 명분이 없어진 것입니다. 2. 그리고 코소보의 독립을 지지했기 때문에 남오세티아의 독립을 지지하지 않을 수 없게되었습니다. 저지시키려 목소리를 낸다면 국제사회에서의 비난은 피할 수 없게되겠죠. 이것은 미국이 힘을 쓰지 못하는 이유이였고 이제는 러시아가 힘을 쓰는 이유에 대해서 말해보겠습니다. 아시다시피 러시아는 Cold War 즉 냉전을 미국과 함께 주도한 나라입니다. 간단히 말하면 미국과 러시아는 라이벌이였습니다. 오늘날에도 미국은 러시아를 매우 견제하고 있습니다. 군사적 견제가 그것 중 한가지인데요. 일단 MD와 NATO 회원국의 숫자를 늘리면서 러시아를 몰아 넣고 있죠. 1. MD는 미사일 디펜스로 사실상 러시아에게 선제공격도 가능한 프로젝트입니다. 한국에게 MD에 참여하라고 미국이 많이 설득했었죠 안했지만. 하여튼, MD 프로젝트로 인해 러시아와 중국을 향해 발사될 수 있는 미사일들이 점점 지구 곳곳에 배치되고 있습니다. 러시아는 당연히 반대하구있구요. 2. NATO는 그 결성 이유도 소련(붕괴전)군과 대등하게 힘을 유지하기위해서 인데 결론은 러시아와는 군사적으론 적(enemy)인 나라들입니다. 그리고 그루지야는 이 NATO에 가입하기 위해 안간힘을 써왔습니다. 이뒤에 내용은 제 주관적이기도하고 그렇게 알려진 의견입니다만 그루지야가 NATO회원국이 될 경우에는 일단 남오세티아는 독립을하기가 매우 힘들어 집니다. NATO회원국들은 서로서로 도와서 안전을 꾀하는 목적도 있기 때문이죠. 3. 2번에 이어서 NATO는 러시아의 군사적 적(enemy)이기 때문에 러시아는 절대로 NATO회원국이 러시아 옆에 생기는것을 원치 않습니다. 즉, 이번 전쟁을 통해서 러시아 주위에 NATO에 가입하려는 의지가 있는 나라들에게 무력시위로 그 의지를 꺽는 것과 동시에 그루지야의 NATO가입 야망을 꺽어버리는 것이죠. 만약 그루지야가 NATO회원국이라면 러시아는 그루지야와 전쟁을 일으키는데 엄청난 부담이 됩니다. NATO회원국들은 러시아가NATO회원국을 침공했기 때문에 그것을 방어한다는 구실로 러시아와 전쟁을 할수 있기 때문이고 그 회원국들은 미국,영국,프랑스 등 군사력이 만만치않기 때문이기도 합니다. 어떤 정책을 피고 어떤 외교가 벌어지든간에 전쟁은 더 이상 없고 오로지 평화만 있기를 빕니다 ! The battle between Russia and Georgia on South Ossetia started because the Georgia Government attacked South Ossetia. The bad part is NATO and America, which are supposed to protect against Russia, don’t have any reason to dispatch their armies to help Georgia and therefore Georgia is basically stepping into the gamble alone. America has started battles against Iraq, Afghanistan, and Iran, and supported the independence of Kosovo. 1. Due to its attacks on the sovereignty of other countries, America doesn’t have any justification to criticize what Russia did to Georgia. 2. Because they supported the independence of Kosovo, they can’t help but to support the independence of South Ossetia. America basically doesn’t have any right to press down Russia internationally. Putin and the Russian government can refute America and continue the battle. America can’t help Georgia, which has a pro-American tendency, and block the independence of South Ossetia because they supported the independence of Kosovo. If they try to block the independence of South Ossetia, they can’t avoid criticism from international society. This is why America can’t show the power. Now I will talk about why Russia can show the power. As you know, Russia is the country that led the Cold War with America. Simply speaking, Russia and America were rivals. Today, America still holds Russia in check. Military check is one of them. America increases the number of MD and NATO members and pushes Russia away. 1. MD is missile defense and the project to attack Russia in advance. America persuaded Korea to participate in MD before. Due to the MD project, more places arrange missiles toward Russia and China. 2. The reason why NATO started was in order to keep the power equally with the Soviet Union. The conclusion is those are enemies with Russia in the military way. Georgia tried to join NATO. It might be just my own opinion. If Georgia will be a member of NATO, South Ossetia will have hard time to be independent. 3. NATO is the military enemy of Russia and therefore Russia doesn’t want the neighbor to be the member of NATO. Through the battle, Russia intends to show the power to the countries that try to join NATO. If Georgia becomes a member of NATO, having the war with Georgia will give the big burden to Russia. NATO members can attack Russia under the pretext of Russia’s attack to NATO and its members, America, England, and France, have strong military power. I hope that there are no more wars and there is only peace!